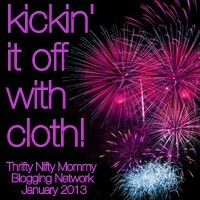 It's the final day of our Kickin' It Off With Cloth event at the Thrifty Nifty Mommy Blogger Network and we have an awesome giveaway to reveal! Do you cloth diaper or are you considering exploring it? Do you prefer to support small businesses? Then I encourage you to visit DivaDiapers! DivaDiapers is owned and run by parents just like you and me! They have experience with cloth diapering their own children and want to do their part to save our planet from further landfill waste, but encouraging others to give it a try. Just like any mom, I love to be able to purchase more than one item in a "shopping trip" and DivaDiapers isn't limited to cloth diapers. They also sell a variety of baby, kid and mommy items and even have a Made in the U.S.A. section where you can browse the companies and their products that are all manufactured in the U.S.A. Personally, I feel that buy purchasing from DivaDiapers, I am able to purchase many of the items I need for my little ones while also supporting a family just like mine. I can't imagine a better type of business to support! DivaDiapers.com is a small family owned business located in Palm Coast, FL. We are the proud parents of a 5 year old and 3 year old both of whom were cloth diapered. Our concern regarding the impact of disposables on our planet led us to the world of cloth diapering. We are proud to bring you the latest and greatest in cloth diapering products and are always on the lookout for new items. If you know of a product that you think is great, email us and we'll look into selling it in our store. We're thrilled you're here and hope you enjoy your shopping experience! Learn More: Visit the DivaDiapers website to learn more about this company and the variety of products they sell! Get Your Own: Go to their online shop, browse all of the items they offer and start shopping today! All orders over $50 ship free to the U.S. Win It: The owners of DivaDiapers are so generously offering you the chance to win a $100 credit to spend on their site! So exciting!! I'd get a best bottoms. I would have to get some mama cloth from knickernappies. for our girl we really need an amber teething necklace and for both the littles wet bags and bum bum balm! I'd get a diaper sprayer, amber teething necklace, and probably some kind of diaper. I would buy some Thirsties hemp inserts, some Bumgenius Elementals, some wipes and wipes solution. Definitely a swim diaper and some fitteds to go under woolies. OWG Vino-Licious Exclusive Coupon Code! Daddy Scrubs Book Review and Giveaway! goodgood box preview and coupon codes!